A home remodeling project should be fun and exciting but can easily become stressful. Phrases like: “We spent twice what the contractor said we would,” or “It’s like we didn’t matter,” have been voiced by homeowners who have had to work with multiple companies to complete their project. These stories can cause doubt for others considering a remodeling project of their own. The good news is, you can hire a company that has both the designer and contractor. These companies are known as Design-Build-Remodeling firms. A Design-Build-Remodeling firm has designers, contractors and an architect all on payroll. This business model considerably reduces the stress factor for the client, making the remodeling experience fun and enjoyable. Other benefits of a Design-Build-Remodeling firm include: accountability, efficiency, cost savings, collaboration with the client, expertise and communication throughout the entire process. Design-Build-Remodeling firms pride themselves in the fact that they allow the client to be in control over their own project. One company is held accountable for the project from start to finish, which adds to the overall efficiency, cost savings and scheduling. The firm is there to communicate throughout the entire process and to lend their expertise. This methodology ensures everyone is working towards the same goal; providing the client a finished product that meets or exceeds expectations on time and budget. If you considering remodeling your home, it is important to find a company that is a good fit for you, your needs and your budget. Kitchen Kraft, located in Columbus, Ohio, is your one-stop shop. We handle everything from plumbing, electrical, framing, demolition, drywall, carpentry, and flooring and eliminate the need to hire multiple remodeling contractors. Our Design-Build-Remodeling firm is at your side every step of the way to ensure your project unfolds the way it was intended. 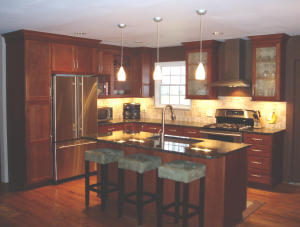 Learn more about our remodeling process or contact us today at 614-449-7200.